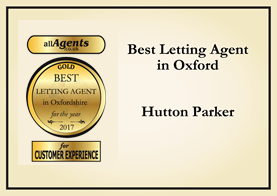 Welcome to Hutton Parker, one of the leading letting agents for Oxford and its surrounding areas. Established in 1982, Hutton Parker is an independent family run business offering specialist services in both property rental and management. We pride ourselves on delivering an excellent, personal service by our experienced local team. With 30 years experience in the lettings industry, we have built up an impressive portfolio of several hundred quality properties that are managed on behalf of our many satisfied landlords. Whether you are professional sharers, a family, students or a landlord we are confident that we can provide you with an excellent service. Call our team now on 01865 728999.